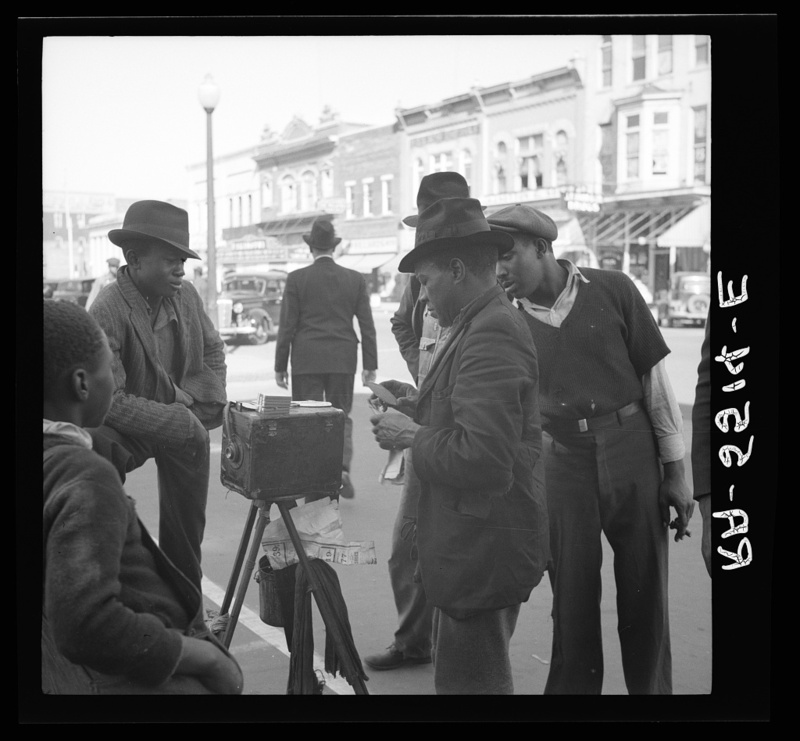 We spent some time today browsing the fabulous archives of the Farm Security Administration and Office of War Information (FSA-OWI) and, as we have a love of all things photography, decided to share some images of tin-type street photographers as we’ve often see their results but rarely seen the faces behind their cameras. 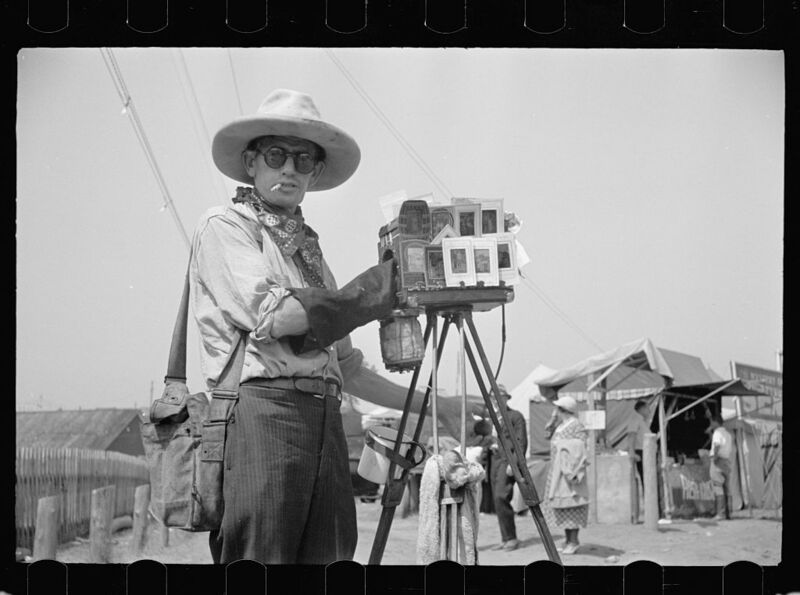 Tin-type photographer at Morrisville, Vermont fair. 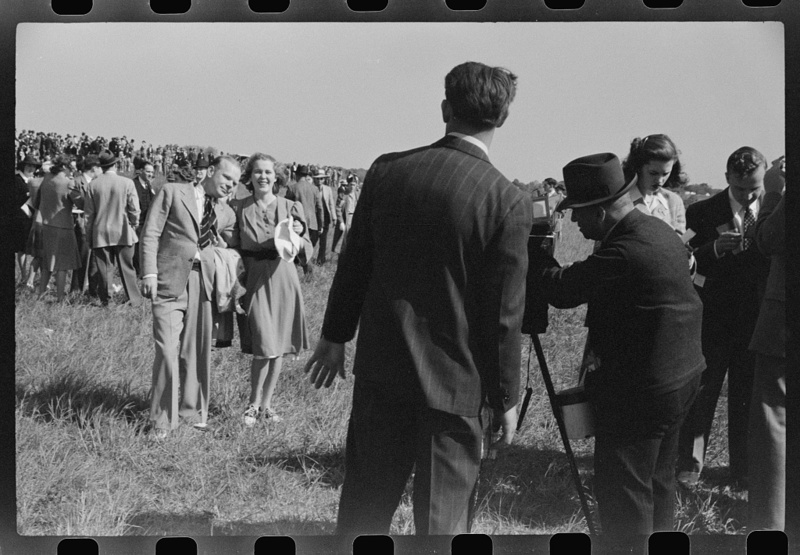 Carl Mydans, August 1936. Street photographer. Smithfield, North Carolina. Arthur Rothstein, October 1936. Itinerant photographer in Columbus, Ohio. 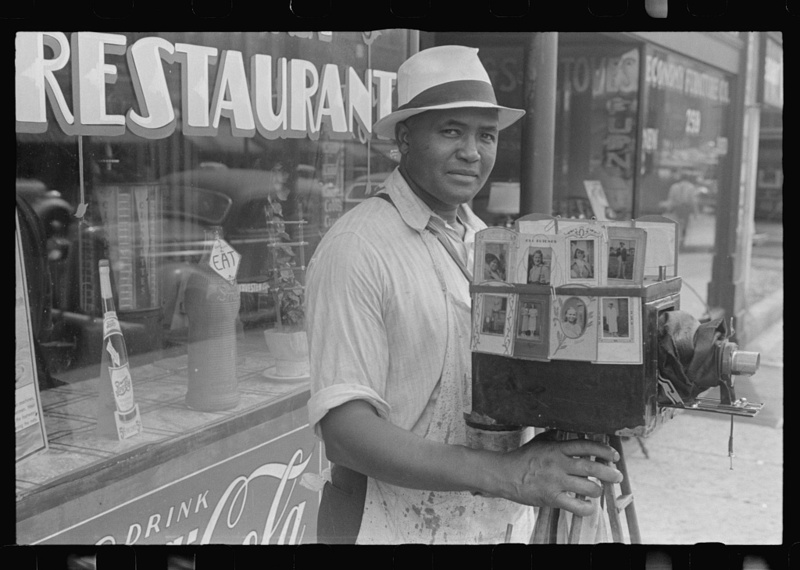 Ben Shahn, August 1938. 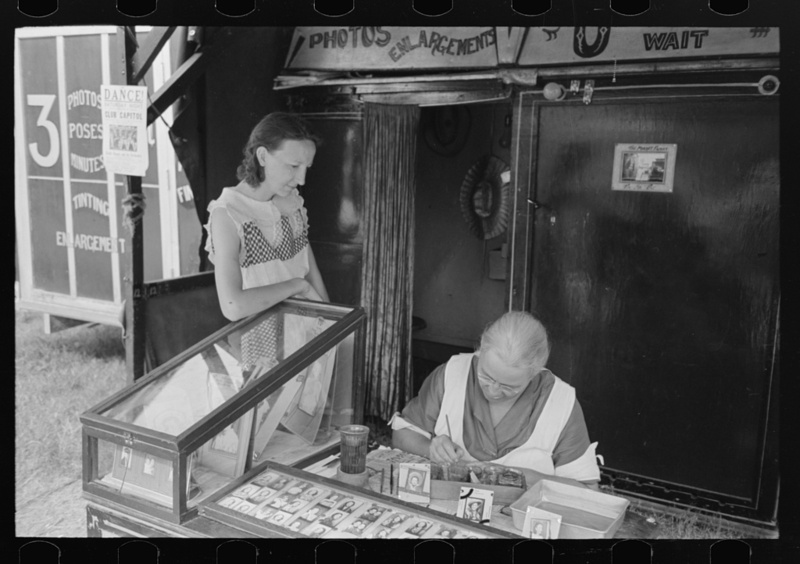 Wife of travelling photographer tinting small portraits, NAtional Rice Festival, Crowley, Louisiana. Russell Lee, October 1938. 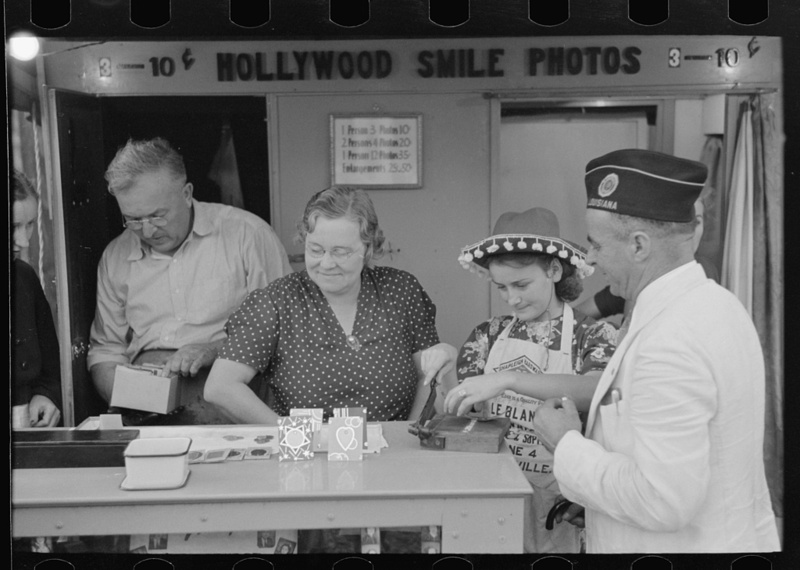 Itinerant photographer’s stand, state fair, Donaldsonville, Louisiana. Russell Lee, November 1938. Travelling photographer making a sale outside warehouse where tobacco auctions are being held. Durham, North Carolina. 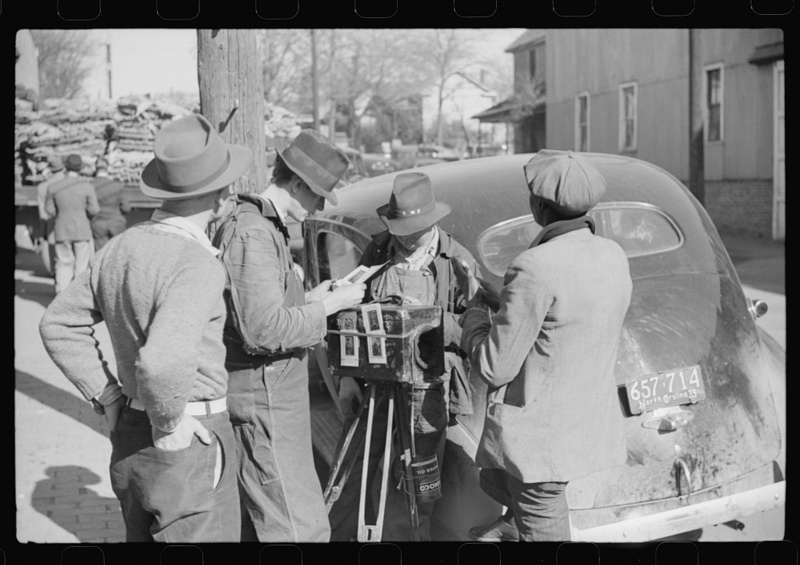 Marion Post Wolcott, November 1939. 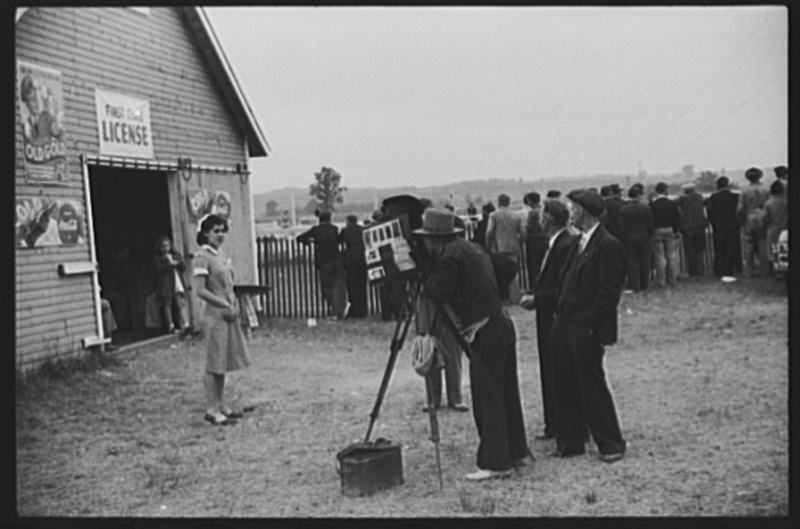 Spectators at horse races, Warrenton, Virginia. 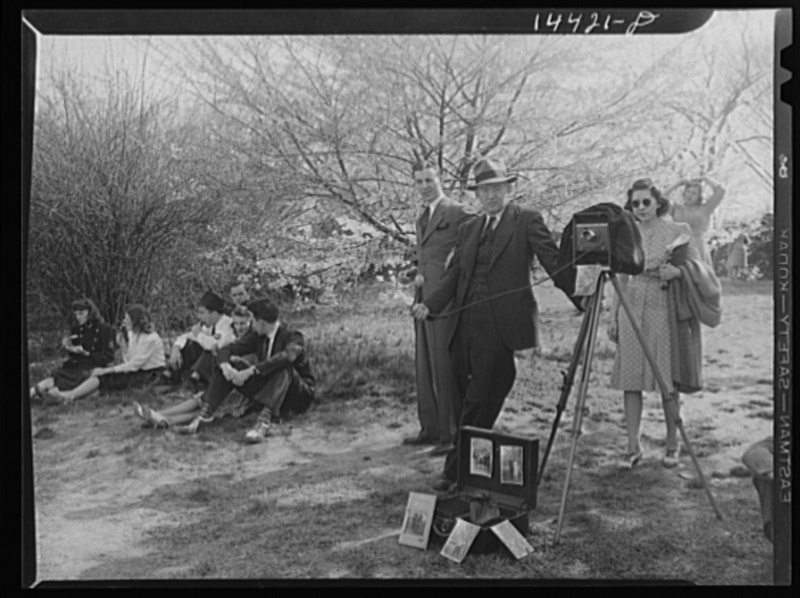 Marion Post Wolcott, May 1941. Send your picture home. 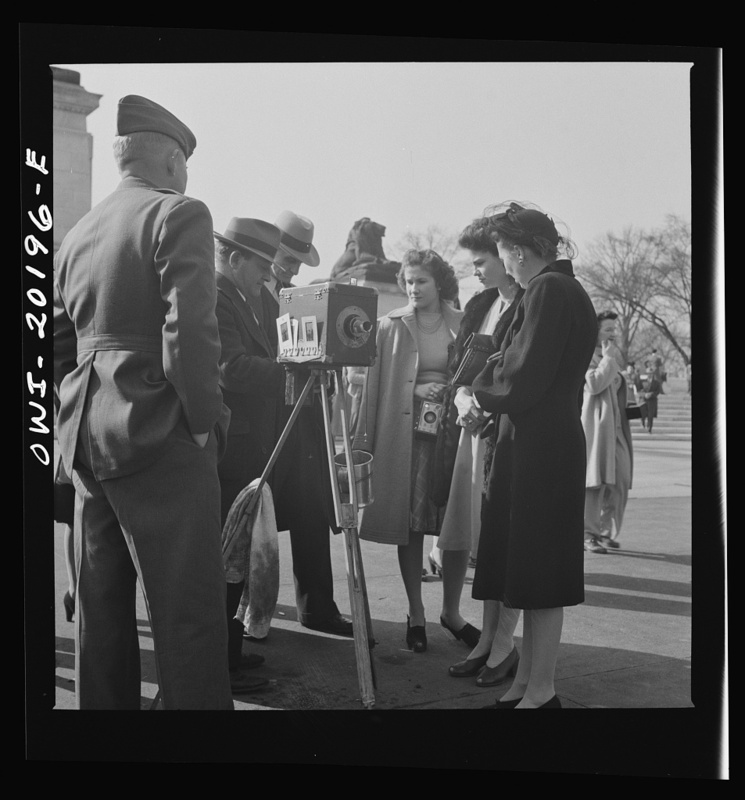 Cherry Blossom Festival, Washington, D.C. Martha McMillan Roberts, May 1941. 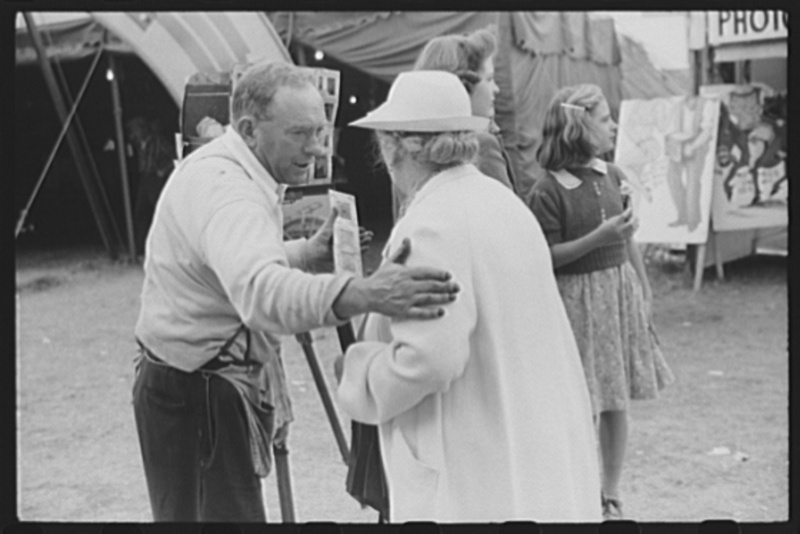 Tintype photographer trying to make a sale at the Champlain Valley Exposition, Essex Junction, Vermont. Jack Delano, August 1941. Essex Junction, Vermont. Tintype photographer at the Champlain Valley Exposition. Jack Delano, August 1941. Props used by tintype photographer at the Champlain Valley Exposition, Essex Junction, Vermont. Jack Delano, August 1941. 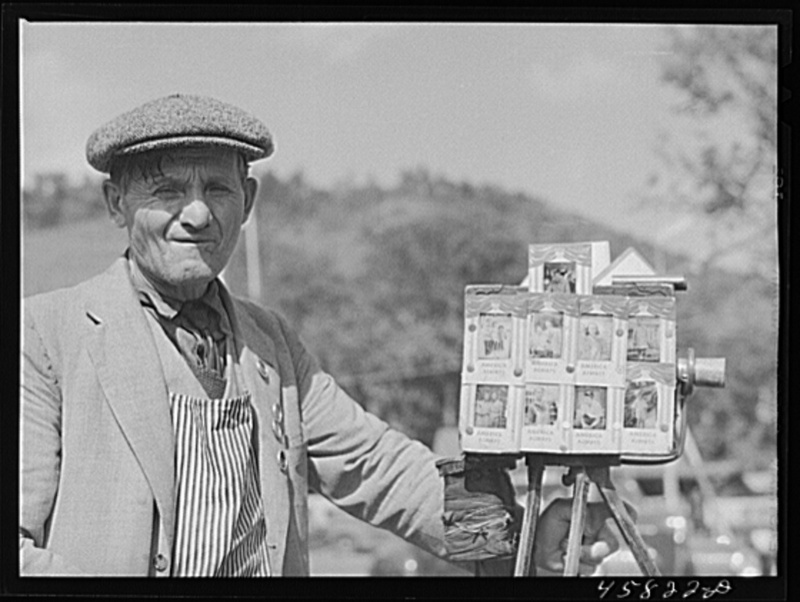 Tintype photographer at the World’s Fair at Tunbridge, Vermont. Jack Delano, September 1941. Washington, D.C. Street photographer in front of the Capitol. Esther Bubley, March 1943. 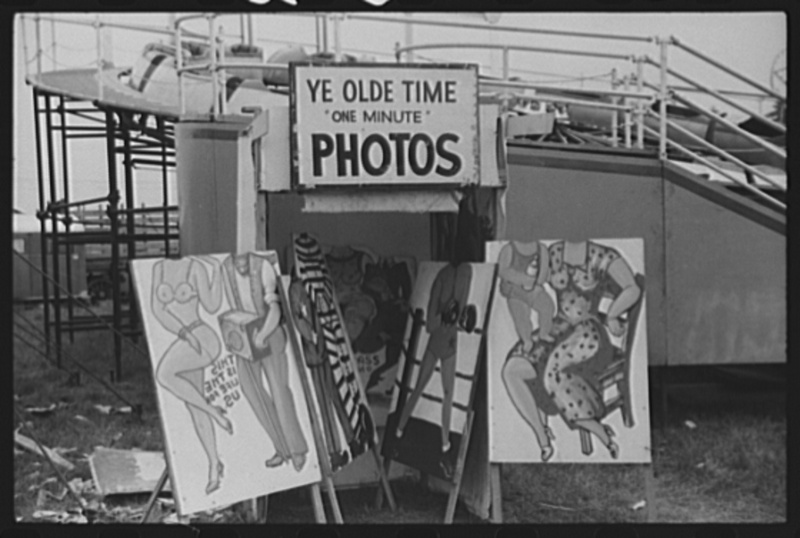 Image credits: Library of Congress, Prints & Photographs Division, FSA/OWI Collection. alternative photography, black and white photography, Inspired, vintage1930s photographers, 1940s photographers, alternative photography, analogue photography, antique photography, arthur rothstein, ben shahn, Black and White, black and white photography, cameras, carl mydans, esther bubley, faces behind the camera, fsa photographs, great depression photographers, itinerant photographers, jack delano, marion post wolcott, martha mcmillan roberts, old fashioned photographer taking picture, photographers taking photographs, pre-war photography, russell lee, street photographers at work, tintype photographers, tintype photographers in the field, travelling photographers, wetplate photographers at work, what did old photographers look like?, what did tintype photographers look like?, what equipment did street photographers use?